Some of you may have seen this recipe which I posted on the BBC food board ages ago. I bought a big piece of belly from Morrisons (ask the butcher), so it is time I make some of this fattening but very yummy and crispy belly pork. Thin belly slices will not work with this recipe. You need a whole piece of belly pork at least 2 lb (l kg) in weight up to 2 kg. 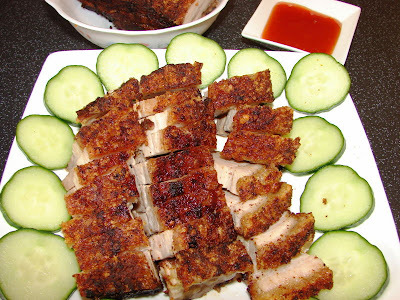 To get the thick and crispy crackling best find a piece of belly pork with a firm and thick skin. Floppy and soft skin will not give you very good crackling. The thickness of the meat is quite important too, try and choose one which is fairly thick at least 3 - 4 cm and with good proportion of lean meat and fat. If there are rib bones on the meat you can either leave them on or cut them out. The meat need to be at least 11 -12 cm wide (wider if the meat is of a bigger piece) and 18 – 22 cm long to get a good crackling and will stand on a wire rack evenly. The Siu Yuk turned out to be very crunchy and nice except for two areas (as seen on the photo the redder spots) which did not get harden and puffed up. I could rescue it with spot grilling but I was too lazy, it's nearly perfect I am happy. **Salted preserved red bean curd is called ‘nam yee’ in Cantonese. It is either sold in a jar or in a tin with squares of red looking tofu pieces in red pickling solution. Smells awful on its own but great in cooking like shrimp paste. If you cannot find preserved red bean curd, leave it out and add a bit more salt. To prepare the meat, first scraped the skin with a knife to remove any dirt or dead skin or hair. Place a rack on your sink and put the meat (skin side up) on the rack. Then pour a kettle of boiling water slowly and evenly over the skin to blanch it. (The hot water will be drained off straight into the sink). The skin will shriveled and the sides will be white(slightly cooked), that’s ok. Leave the skin to cool slightly. Score the skin with a small sharp knife in a tight diamond pattern or prick with a sharp skewer all over the skin, the more you score or prick the skin the better the crackling. Turn the meat over skin side down, make deep cuts lengthwise (1/3 deep the thickness of the meat) and 3 cm apart. If there are rib bones, cut along the rib bones. This is to help the seasoning to absorb into the meat. Mix the marinate ingredients together, rub all over the meat side only, a bit more between the cuts. Turn the meat over, if there is any marinate on the skin wipe it off with a damp kitchen towel. No seasoning on the skin at all. Put the meat on a dish, meat side down, covered with cling film and leave to marinate for at least 3 - 4 hours up to 36 hours, for longer hours leave in the fridge. The longer the meat is marinated the more tender and juicier it is. To prepare for roasting, preheat the oven to about 210 deg C.
Use a deep roasting tin bigger than the piece of meat. Put a metal rack on the tin (the rack needs to be about 3 - 4 cm high). Pour boiling water into the roasting tin (about 1 - 2 cm deep). Rub the belly skin with some cooking oil (to prevent skin sticking to the rack). Rest the meat on the rack, skin side down. Roast for 25 – 30 minutes, then turn the meat over (skin side up). You can prick the skin some more if you wish. More pricking the skin will be more crispier. Return the meat back into the oven, roasting for another 25 – 35 minutes till the meat is done. (longer if the meat is over 1 kg, calculate using 20 minutes per lb + 20 – 25 minutes extra). 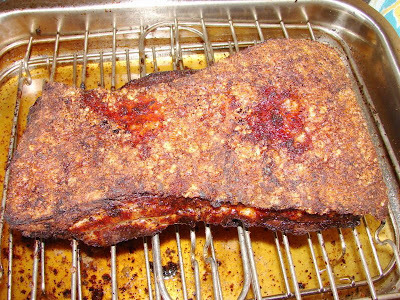 Turn the heat up to 220 deg C during the last 15 minutes of cooking to help the crackling to puff or if you have a fan grill function turn that on and lower the heat to about 200deg C.
The skin will crackle and pop forming a nice crackling. Wait till all or nearly all parts of the skin has puffed up nicely then take it out to rest and cool before cutting into small chunks. If the skin is still soft without a hard crackling when the meat is done, turn the grill on, put the meat skin side up about 8 cm under a medium grill and heat it till the skin started to pop and crack for few minutes. Keep a close eye when grilling as the crackling will burn easily. The best crackling to achieve is one which is quite puffy and very crunchy and tasty. This depends on quality of meat, cut of meat, oven and experience. Born and raised in Indonesia, studied and had professional career in civil services in the Netherlands, I now live in France. I too love SE Asian food. Tour recipe is the best I ever found.